Today is the big day: Emeril's Kicked Up Sandwiches goes on sale! And what better way to celebrate than with cake. Not any ordinary cake either but rather a kicked up sandwich kind of cake. Although the title says sandwiches Emeril's new book includes so much more...even yummy desserts like the Almond Poppy Seed Pound Cake with lemon Neufchatel filling. This moist dense cake is perfect on it's own...and taken to a new level with the lemon cream cheese filling. Unfortunately, this is one of the recipes we aren't allowed to share but if you are intrigued at all and I hope you are, you can order a copy of the book today. I almost forgot....The Lucky Winner is: Moonsword Congratulations! Is the cake strong enough to be sliced thinner for the sandwich? I posted about this same sandwich today! It really was so, so good! Nice job! 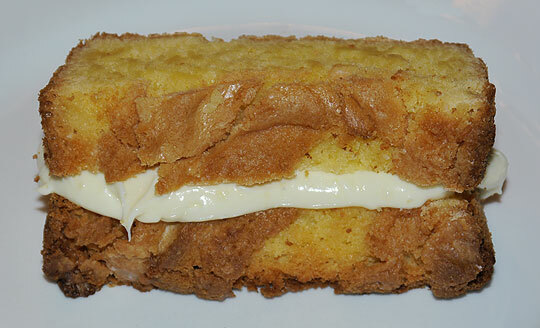 I really like this cake recipe, especially with the not-too-sweet lemon cream cheese filling!